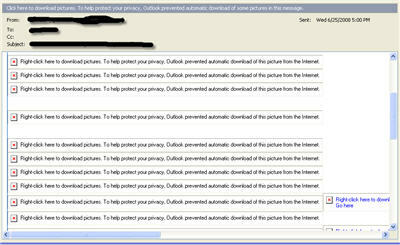 Both of the mail clients I use, Outlook at work and Gmail for personal, strip images out of HTML email... I think most mail clients are doing this now. So, why do people continue to send HTML emails that depend on images? There was no text in the email, just links to pictures. In todays world of limited attention, why assume that people are going to be able to view your communication? Why not have some metrics in place that show who on the mailing list actually download the email - if they don't download the images, switch to a non-HTML version the next go around and offer them the ability to get the HTML version back? So neither of your mail clients block images but allow you to download them? I guess I'm fortunate in using Entourage. Rich, both of my mail clients block images, and forces me to download them. Actually, my third mail client, my iPhone, just grabs the images and fully renders HTML email... graphics and all. I don't want the images and am glad that my mail clients block them. My point is that given so many people using Outlook and Gmail, why do people depend on their message coming through correctly via images?